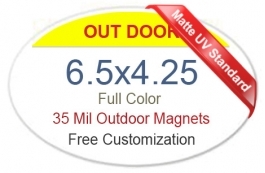 Custom 6.5 x 4.25 inch oval outdoor custom full color magnets can be employed for making big bang business announcements or introducing the business to folks in your city. This magnet is definitely going to be a head turner due to its unique shape and can attract anyone with its impressive shape. 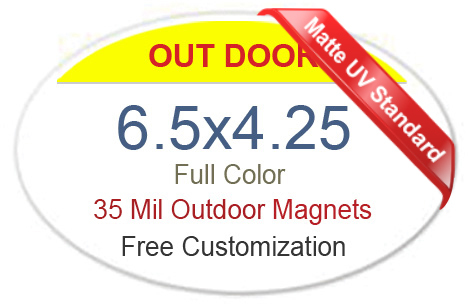 A promotional 6.5 x 4.25 inch oval outdoor full color magnet can be creatively utilized by advertisers to build rapport with their targeted customers. It can be employed for announcing some discounts, festival offers, mega bonanzas, etc. A personalized 6.5 x 4.35 oval outdoor magnet may not register 1000 impressions at a time, still advertisers can use it wisely to grab <100 worthy impressions. Product Size : 6.5 in. x 4.25 in.